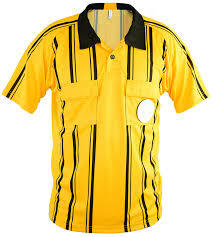 This year the new referee uniform is required. The biggest change to previous uniforms are shirt and socks. 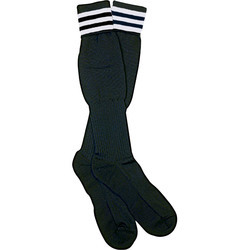 If you own the old 3 strip socks or old pinstripe and broad stripe shirt, they are no longer part of the official uniform and should not be worn. Each season I'm asked "What color shirt do I need?" 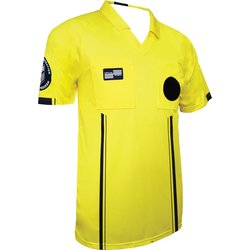 - for all referees the basic uniform should be a short-sleeve yellow USSF jersey, black referee shorts (these are not player shorts), the two stripe USSF referee socks, black, or mostly black, shoes, and the badge of the current year. This will cover most games. 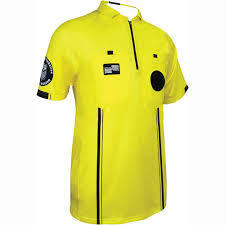 As you develop and accept more challenging games (travel and tournaments) you may need other colors. I've found that in our area, black is a good alternate then red if you need a third. Yellow, Black, Red, Blue and Green are currently the only authorized colors. 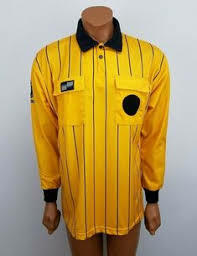 There are several resources online where you can find referee equipment - I listed a few below. Ensure you're getting the current authorized version as several sites still have the old styles listed. I've seen the economy jerseys from $21 and the pro jersey from $26.